A Mr. Alley is shown at the R.J. Peacock Canning Co. dock in Lubec. 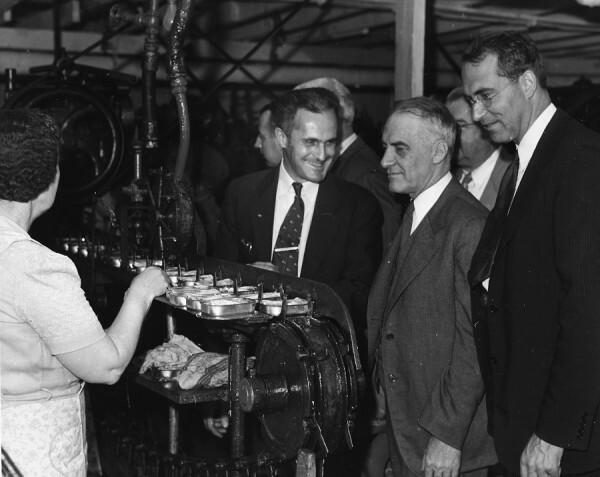 Carroll B. Peacock (from left) shows off his company's sardine canning plant to Congressman Frank Fellows and Gov. Horace Hildreth. SEARSPORT, Maine — The sardine industry in Maine has passed into history. Someday, someone may figure out a way to make the business of catching herring and canning them as sardines profitable here again. But by all available evidence, it’s over. That sentiment is what prompted the Peacock family to donate business records and photographs from the R.J. Peacock Canning Co. to the Penobscot Marine Museum, said Cipperly Good, the museum’s collections manager. Robert and Jeanne Peacock contacted the museum in the fall, Good said, to offer the donation. The company operated for most of the early 20th century through the 1990s. “It’s sort of the end of the era for sardine canneries,” she said Wednesday, after spreading out the contents of folders holding newspaper clippings, stock certificates, IRS filings, annual reports, photographs and memorabilia onto a table in the museum’s library. The Peacock family operated canneries in Eastport, Lubec and Portland. It wasn’t that long ago that those and other coastal Maine towns churned out thousands of cans of sardines. “We don’t eat sardines anymore,” Good observed. More recently, the fish were mostly used for cat food and lobster bait. Those in the industry blame overly rigorous government regulations for the demise, while others say the species were overharvested, especially when boats would employ spotter planes allowing the vessels to scoop up herring by the ton. 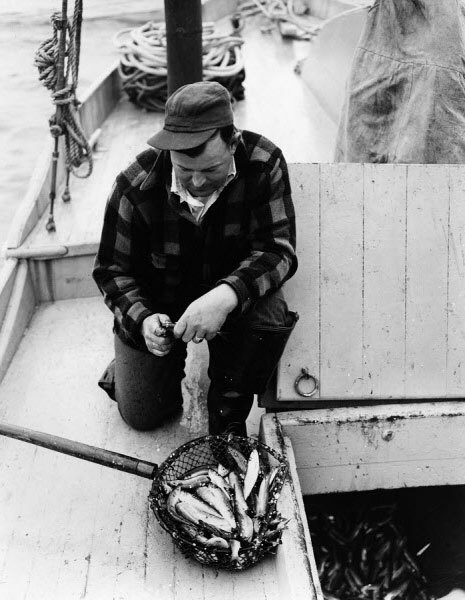 Among the documents in the collection is a 1952 publication reporting on the herring catch in Maine in 1948 and 1949, compiled in part by the state Department of Sea and Shore Fisheries. Weirs are stationary nets that hang in a semicircle from makeshift posts near the shore into which the schools of herring would swim. Seiners are boats that used a pocket-like net. Eventually, the photographs will be digitally saved in the museum collection. The collection can be reviewed by researchers by contacting Good at 548-2529, ext. 212 or emailing her at cgood@pmm-maine.org.